MF Cardamone creates artwork that harks back to centuries past but is deeply rooted in the present. Her cultural and sociological commentary, delivered in words and images, reveals her sly sense of humor and love of all things botanical. An artist fluent in various media, including painting, sculpture, and limited-edition clothing, Cardamone (American, b. 1958) discovered her passion for plants when she restored a garden at her seventy-five-year-old farmhouse near Philadelphia. 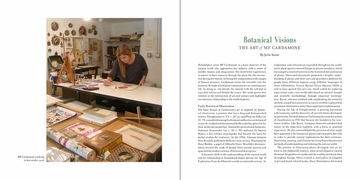 She enrolled in the Barnes Foundation Arboretum School and learned to collect specimens and create herbarium sheets, documenting the many medicinal uses of plants along with their history and landscaping potential. 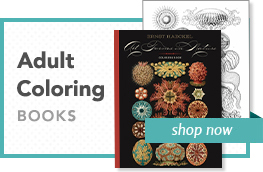 She picked up old books of botanical illustration, and herbals from a time when a pharmacist might prescribe a homemade tea to cure whatever ailed you. When her studies expanded to medical QiGong and Hatha yoga, her artwork took on a spiritual dimension. 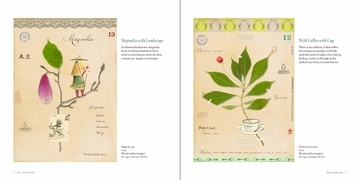 Cardamone begins with a plant specimen and watercolor paper, then turns to gouache, pen and ink, and digital imagery. 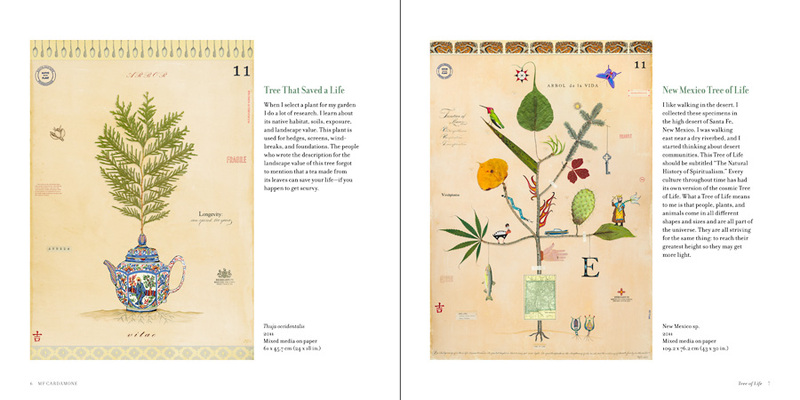 She balances the scientific aspect of her work with a large dose of humor in the selection and placement of cultural icons from the plant’s home environment. 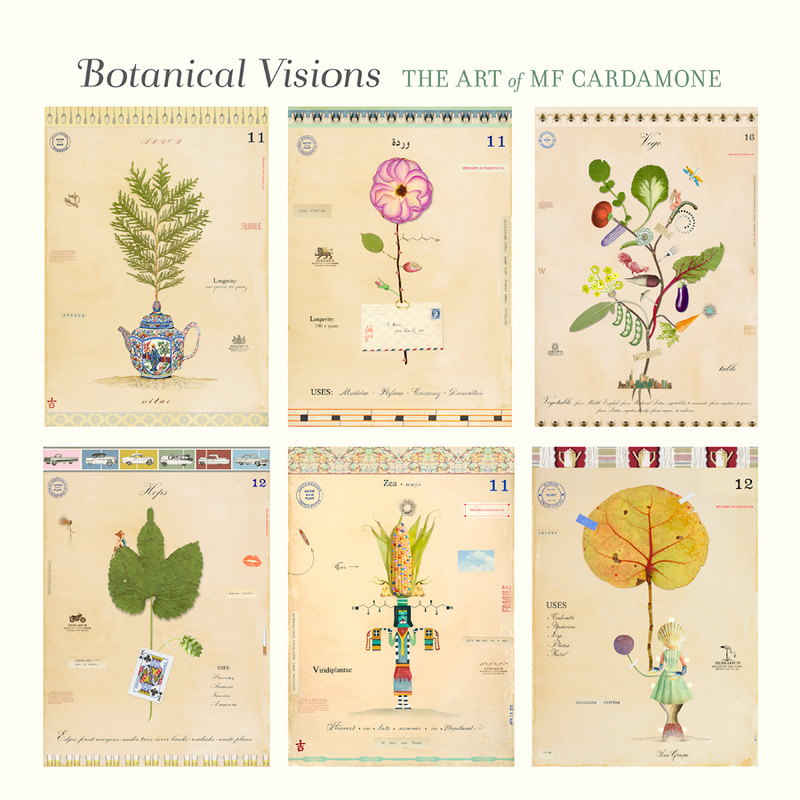 Once Cardamone developed her signature style of combining the historical, medicinal, ecological, cultural, and spiritual life of plants, her art opened new possibilities for her. She now works with conservation organizations on multiple hemispheres, creating art that is entertaining as well as educational, helping to promote the preservation of plant life, and in turn supporting all life. 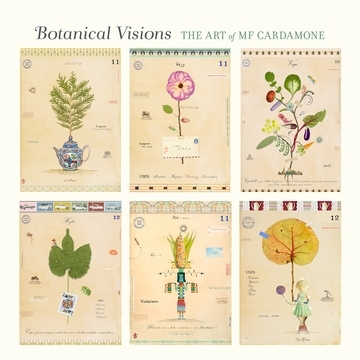 Botanical Visions: The Art of MF Cardamone is filled with one hundred attention-grabbing, full-color reproductions of Cardamone’s singular art. Including an essay by Julie Sasse, PhD, chief curator at the Tucson Museum of Art, this monograph showcases intriguing art that takes tradition for a spin. About the Author Julie Sasse, PhD, is chief curator and the curator of modern, contemporary, and Latin American art at the Tucson Museum of Art. Since joining the museum, she has organized more than ninety solo and group exhibitions of regional, national, and international artists. She is the author of more than thirty-five catalogs, books, and published essays. She holds a BA from Southern Illinois University, an MFA and an MA in art history from Arizona State University, and a PhD from the University of Arizona.